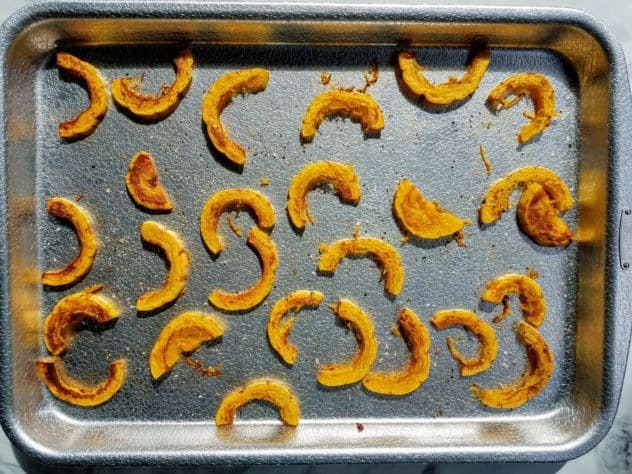 I first tasted roasted delicata squash in graduate school when one of my friends prepared it. If you like butternut squash, then you will definitely love delicata squash. In my opinion, it has a lot more flavor than butternut, and roasting the squash really brings it out. All you need to pair it with is a little olive oil, salt, and pepper. I also like to drizzle a little bit of honey over it before eating. This is one of my all time favorite side dishes, and I frequently make it as a snack during Fall. I’ve been known to go to the grocery store and buy up their whole supply, that’s how much I love it! 🙂 Also, I know a lot of people throw away the seeds. But don’t! You can actually flavor them and roast them exactly like pumpkin seeds. They pack a ton of nutritional value too! Do you have to peel Delicata squash? Nope! 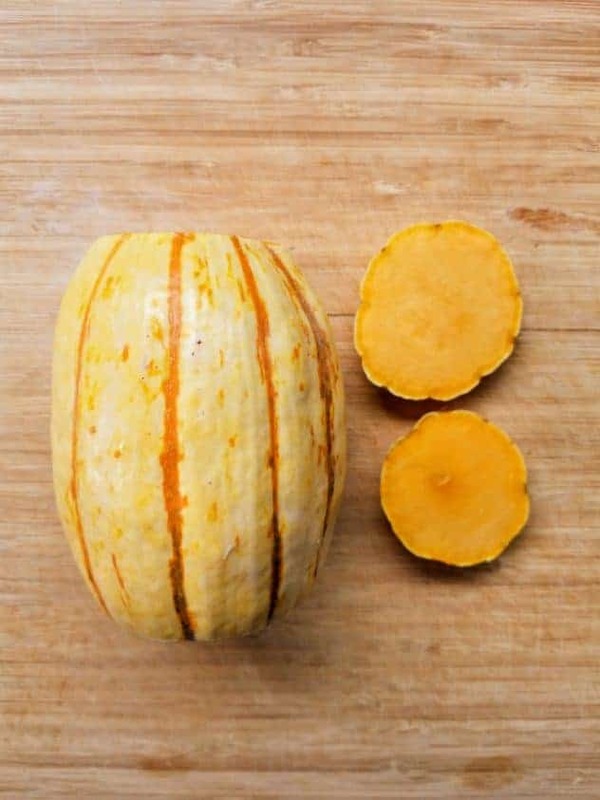 Unlike butternut and kabocha squash which have tough skins that need to be peeled, the skin of a delicata squash is much more tender and edible. Like HEAVEN! Seriously, delicata squash is my favorite. I buy out most of the display as soon as they come out. To me, it tastes sweeter and more buttery than a butternut squash (this was my old favorite). Delicata squash is sweet enough that you only need olive oil, salt, and pepper on it. This makes it a really healthy side or a snack! How do you know when Delicata squash is ripe? A Delicata squash is ripe when the vertical strips of color in the grooves turns orange. It’s unripe when they are dark green. Is Delicata squash skin edible? Yes! This makes preparation of Delicata squash very easy! If you’ve ever had to peel a butternut squash before, you know what I am talking about :). What can I substitute for Delicata squash? Depending on the recipe, good substitutes include sweet potatoes, butternut squash, or acorn squash. Yes! 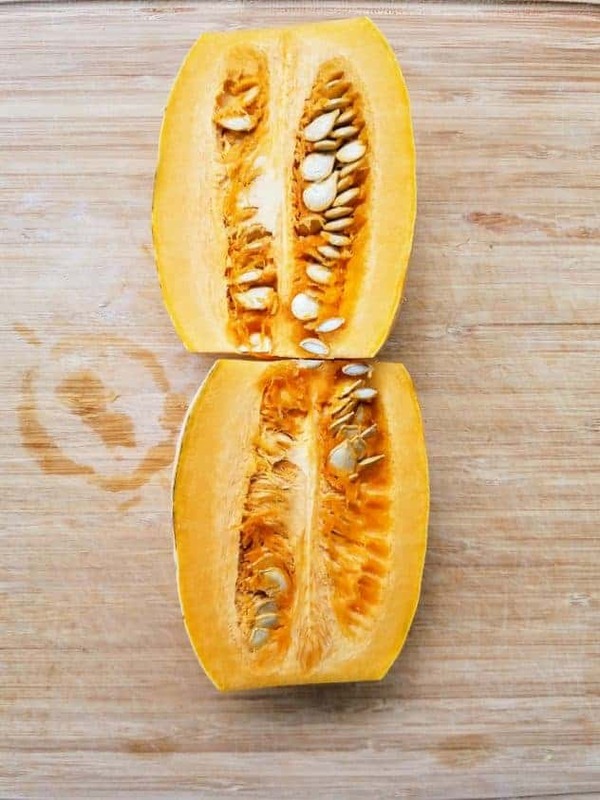 Just like a pumpkin, the seeds are edible. 1. Preheat oven to 425°F. Wash delicata squash, then pat dry with a towel. 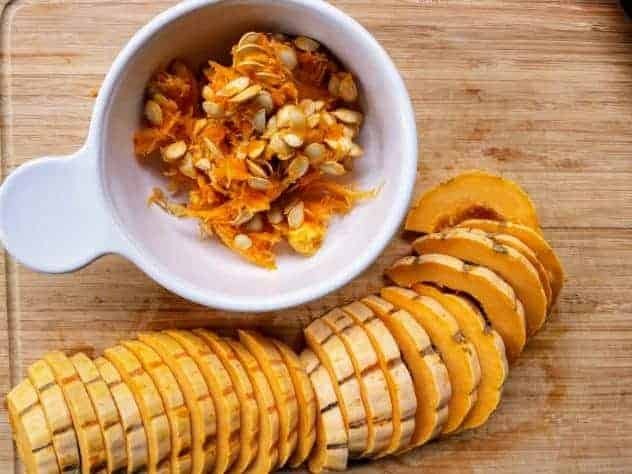 Using a chef’s knife, cut off ends of delicata squash, halve lengthwise, then scoop out seeds. You can either discard them, or roast them like pumpkin seeds. To scoop out the seeds, I like to use something rigid like an ice cream scoop. 2. Moving along the length of the squash, make cuts perpendicular to the grooves on the squash. Each piece should look like a half moon, 1/4″-1/2″ thick. 3. 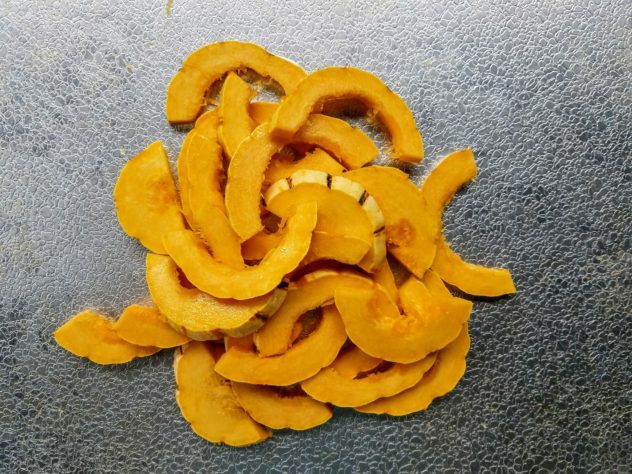 On a baking sheet, pile up the delicata squash pieces. Drizzle with extra light olive oil and toss with your hands to coat. Season with freshly ground Himalayan pink salt and freshly ground black pepper to taste. 4. Roast for 30-40 minutes or until delicata squash starts to brown, removing sheet halfway through baking time to flip delicata squash. You want the squash part to be tender, and the skin to be crispy almost like a potato chip. If your pieces are closer to 1/4″ in thickness, I would only roast for 30 minutes. For 1/2″ pieces, 40 minutes. This roasted delicata squash consists of only two ingredients, so the prep work is minimal. It also pairs well with a variety of dishes. Wash delicata squash, then pat dry with a towel. Using a chef’s knife, cut off ends of delicata squash, halve lengthwise, then scoop out seeds. You can either discard them, or roast them like pumpkin seeds. 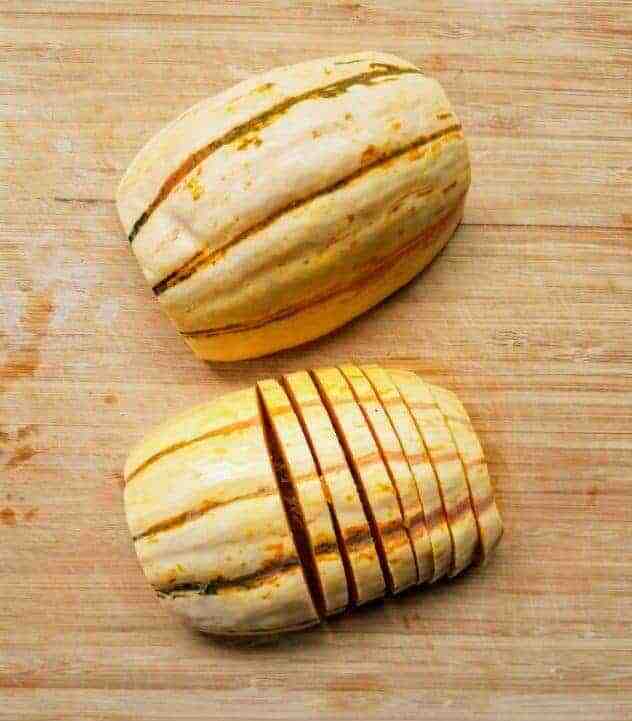 Moving along the length of the squash, make cuts perpendicular to the grooves on the squash. Each piece should look like a half moon, 1/4″-1/2″ thick. 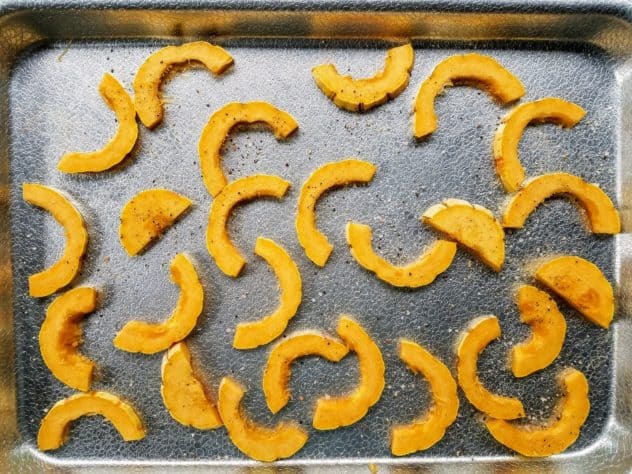 On a baking sheet, pile up the delicata squash pieces. Drizzle with extra light olive oil and toss with your hands to coat. Season with freshly ground Himalayan pink salt and freshly ground black pepper to taste. Roast for 30-40 minutes or until delicata squash starts to brown, removing sheet halfway through baking time to flip delicata squash. If desired, drizzle delicata squash pieces with honey and serve. 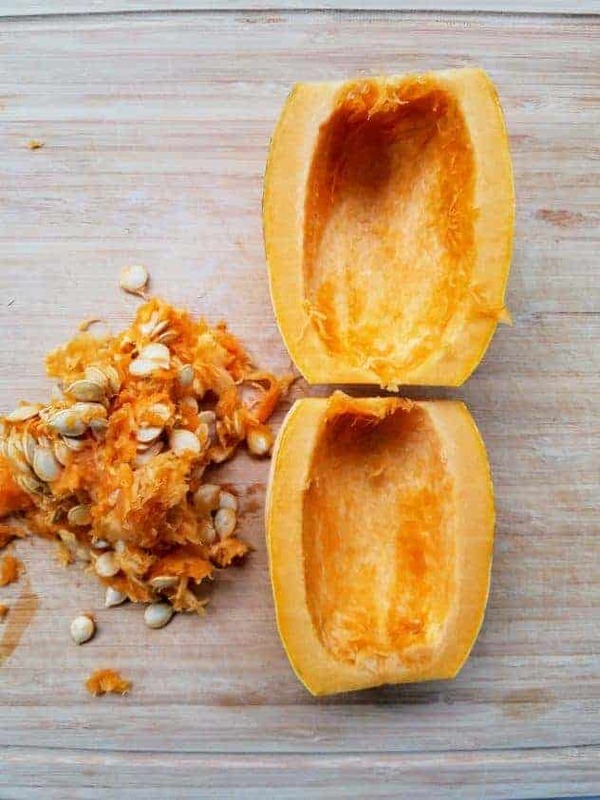 I liked this post, I’d never heard of Delicata Squash before so it was really helpful that you had a brief guide in the beginning with information on this squash, like about the skin and how to know when it’s ripe. It looked really delicious and I really want to make this recipe now! Perfect timing for me to read this post. I always need to call my mom to ask how to prepare squash. Oh wow I havent heard of this before but Im assuming it'[s like butternut squash which I love! I bet that tastes amazing! I really appreciate your info on how you slice the squash. I’ve always had a difficult time cutting up butternut squash. Squashes look just like pumpkin and your method of preparation is so new to me yet so great. No wonder thy look so delicious! Delicata Squash is something new for me. At first I thought it was pumpkin but this is a whole new dish. Loved the preparation as I usually enjoy roasted dishes and they taste really good. Now you have got me curious with this new recipe. I would love to find Delicata Squash and try it out! Drizzle of honey sounds delicious. Squash is one of my favorite. I usually saute it with other vegetables , we called it here “bulanglang” . I might try this recipe of yours next weekend. I’m not an avid fan of squash, but you’ve tempted me into giving it another go. Thanks for the tips! I have never tried delicata squash before but after reading this post I am definitely going to be trying it as soon as possible. I love butternut squash so I am excited to compare.